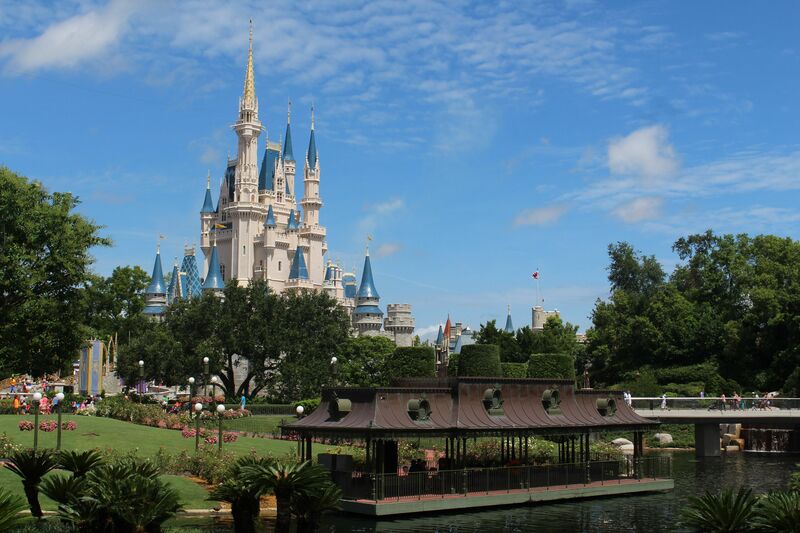 Disney World offers accommodations in all price ranges, including newer themed resorts for Disney fans on a budget. And even the least expensive lodging carries certain privileges like early admission to certain parks. Simple Rooms: The themeparks’ best value hotels are comparable to an Orlando budget motel, but with more Disney design flair, fun pools and food courts, and the advantage of being on Disney property (albeit farthest from the theme parks). Standard value rooms facing an exterior walkway are grouped in three-story blocks and accommodate up to four, usually in two double beds. Trying to save by cooking meals? Try family suites and units with kitchen facilities at Disney’s All Star Music resort and the cabins at Fort Wilderness Campground; both sleep up to six. If having a kitchen is important to you, look at Orlando vacation home rental properties, as many are very close to the park. Traveling for a Reunion or Youth Group? Planning a family reunion? There’s also Walt Disney World Resort’s Deluxe Villas sleeping 8 to as many as 9 in some units, and they come complete with a full kitchen, whirlpool tub, washer, dryer and more. All value-priced resorts are popular with groups, especially youth groups competing at the nearby ESPN Wide World of Sports stadium. Top Benefits? Price — double rooms from $100 per night, with frequent specials and theme park pass promotions. Laundry rooms, some kitchenettes, cheap food courts, big swimming pools, nice neighbors, lots of exterior lawns to play on, parking so you can leave the car and shuttle around. New! In October 2017, WDW will launch a pilot program welcoming dogs to the Disney’s Art of Animation Resort and the cabins at Disney’s Ft. Wilderness Resort, up to two dogs per room, for a fee of $50/night. Pets get Pluto themed amenities and there are exterior dog play areas; call 407 W-DISNEY (800/800-9800 for Disney Vacation Club members), or visit their site to be sure. Downsides? Guest complaints include poor soundproofing between rooms, cramped quarters, and very long lines to board theme park buses during the busy season. At 5,700 rooms, the All-Star Resort (407/939-6000) was once the largest hotel in the world. By separating it into different zones, each with its own check-in, and masking all the exterior stairwells with huge iconic sculptures of megaphones, Coca-Cola cups, a tennis ball can and more, WDW succeeds in making these hotels seem more like fun and less like a convention center. There’s an outdoor play ground area for climbing, swings and slides and indoor games arcades. Rates for the following locales start at just $90. At Disney’s All-Star Resort Music is currently undergoing refurbishments from August through December, 2014. There are wings dedicated to every tune from Calypso to Country Fair to Broadway’s Great White Way, with big bongos and other music props, containing 1,604 spotless but basic rooms with minimal services. Big with families are the 214 one-bedroom family suites sleeping six that are WDW’s best value. These new units were created from two old standard rooms; they are bright, and comfortably furnished. The bedroom has a queen bed, TV, chest of drawers, and ensuite bathroom. The living room has a leatherette couch that opens into a double sofa bed, an armchair that opens into a single bed, and a matching ottoman that pulls up and out into another single bed. There’s a second bathroom, a second TV set, and a cheerful kitchenette with microwave, fridge, sink and coffeemaker. The Music resort carries its music theme to the max with a guitar-shaped swimming pool. There’s also an onsite “Intermission Food Court” with a self-serve station of deli style sandwiches, snacks and treats. Disney’s All-Star Resort Sports is in the same ballpark, both in thematic emphasis and price-wise. Guests checking in will feel like they are entering a basketball gymnasium. Stairs are tucked into footballs and hockey sticks. This resort is said to be most popular with young boys, so it gets quite crowded over school breaks. Take a dip in the pool with a surfboard motif, feed hungry kids at the “End Zone” food court with pizza, pasta, nachos and burgers and relax with a complimentary Disney film shown poolside. Disney’s All-Star Resorts Movies has 1,920 rooms clustered into wings based on hit movies like “Fantasia,” “101 Dalmatians” and “The Love Bug,” whose wing has the Herbie car poking through the wall. These buildings have accouterments such as a 38-foot-tall Buzz Lightyear sign, a “Mighty Ducks” hockey-themed pool and a large character playground. A family favorite with what’s considered the best marquee food court. This 2,880-room Pop Century Resort marked by huge bowling pins celebrates American popular culture from the 1950s to the 1990s. Located near the ESPN Wide World of Sports Area, it is outfitted with bright, bold, larger-than-life icons such as a Play-Doh can and the Rubik’s Cube. Room blocks are divided by decade, with rooms around themed courtyards and stairs hidden by huge cellphones, bowling pins, Yo-Yos and more. Though accommodations are small rooms with two double beds, these rooms have space for a rollaway if kids don’t want to share a bed. The three pools (one larger, two small) are graced with peace signs, slogans, and Warholesque flowers; other charming pop culture clichés are on display in the lively food court. For more information 407/938-4040. Rates start at $100/night. Disney’s Art of Animation Resort is located near the Pop Century and offers nearly 2,000 family rooms and suites devoted to some of the most beloved Walt Disney and Disney Pixar movies. The delightful hotel wings themed to “Finding Nemo,” “The Lion King,” “Little Mermaid” and “Cars”… with all the larger than life props you can imagine. Nemo was the first phase of this top-calibre Disney World Resort hotel property (the resort’s 25th). That theming dominates the enormous Big Blue Pool area with its underwater sound system, as well as the wing closest to the central lobby Animation Hall. Families can immerse themselves in the “Little Mermaid’s” marine life with 864 themed double rooms that accommodate four. Much more fun if you can afford the starting price of $272 — any of the 1,120 suites accommodating six in a layout including a master bedroom, three sleeping areas, two bathrooms and a kitchenette. Animated scenes cover building exteriors and room interiors; there’s even an easel by the front driveway so that kids can channel their inner animator while waiting for the shuttle. Landscape of Flavors, the on-site dining option is an animation-themed food court with pretty good food, and there are four themed courtyard play areas, three pools (check out the one from Cars at the Cozy Cone Motel), and a video arcade. Handicap facilities are widely available. If you don’t like walking, make this known to their booking agent so you can reserve something closer to the lobby and bus area. Note, this is a pet-friendly resort. Rates for standard rooms start at $110/night. With 784 campsites and 409 cabins, Fort Wilderness is prized by Disney cognoscenti for its authentic place in Disney World history. Just over 40 years ago, this “wilderness” playground and ranch near Magic Kingdom (with the South Seas-styled Polynesian Resort and the ultra-modern Contemporary Resort), gave proof to Walt Disney’s vision of a magical world where Americans could play at being anything they liked. The tranquil 750-acre property, including the historic Tri-circle-D Ranch and a fishing lake, has, since 1971, housed all the horses employed by WDW. Don’t miss the Walt Disney and Horses Museum display on the property or the farm animals located nearby. Today, the very popular “Hoop Dee Doo Musical Revue” (said to be the longest running musical in America!) is held nightly near the corral and trail rides, and there’s a logpole store and restaurant housing Mickey’s Backyard Barbecue. An expanded Fort Wilderness has a marina with canoe and powerboat rentals, a small sand beach for sunbathing, tennis, rental golf carts and bicycles, and several playgrounds. There are free nightly film screenings out of doors following Chip n’ Dale’s Campfire Sing-a-Long, the time when guitars, denim, square dancing and marshmallows take over. This is a free and fun night out for families staying at any property. From Fort Wilderness, there are myriad buses and free boat launch service from the north end, on Bay Lake, to Magic Kingdom. (For information on the Wilderness Lodge, see the WDW Deluxe Resorts category). Rates start at $49/night for camping. Sleeping facilities are extensive. 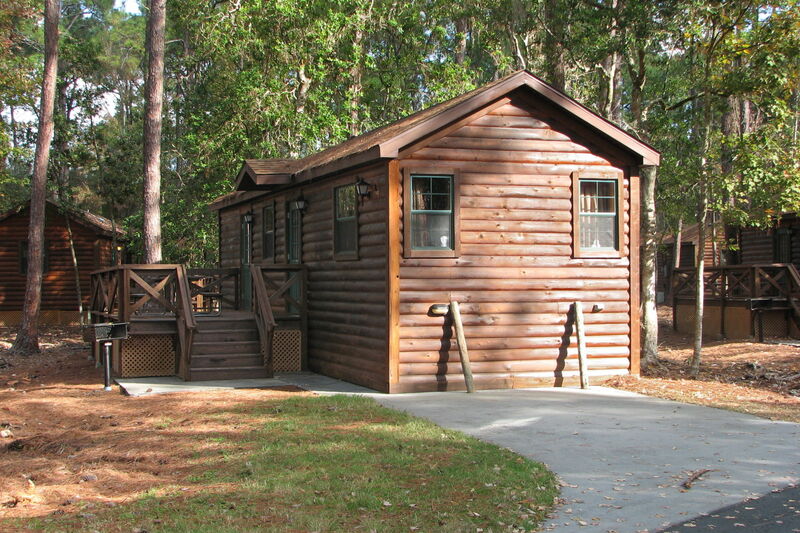 The campground is divided into four sections with their own bathhouses and showers. The newest is the most private with fewer campers per lot and more landscaping; the next two have the usual campground amenities of water, sewage and electricity, plus hi-speed Internet access. The northernmost Settlement, where once 10 Airstream trailers were available for rental, is packed with RVs in the million-dollar-plus range. Die-hard fans with tricked out golf carts and piles of Mickey plush in their windows spend months here, and it’s the only WDW property that accepts pets. The Meadows area in the middle has smaller RV units, pop-ups, and tent sites for intrepid campers. This is closest to the main pool, arcade, snack bar and equipment rentals. The more wooded and undeveloped Outpost, location of 409 furnished cabins, is in the south. Note, this is a pet-friendly resort. These 500-square-foot cabins have a big front porch with picnic table and grill, a small bedroom with a queen and two bunk beds, and a compact living room with small kitchen and a pull-down double Murphy bed. There’s space, some wood paneling, lots of carpet, and tepid styling, but with two TVs and room to sleep 6, these are good value. Disney provides daily maid service at rates run about $294/night depending on season. For more information, call 407/824-2900. As soon as you make some choices, work with a travel agent to secure reservations; many resorts sell out six to eight months in advance. However, there will always be room at the inn when you realize that more than 30,000 rooms are now available at Disney World. You can call Disney at 407/934-7639 or visit the Disney World site to get more information and brochures.